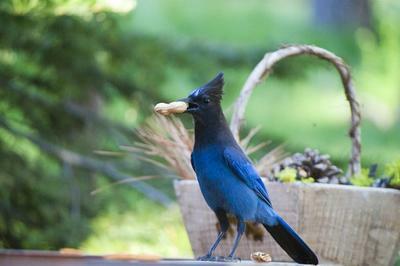 This Stellar Jay hung out at our rental house in Truckee, and after some time we realized that his constant squawking was a request, or rather demand, for peanuts! We placed peanuts on the deck railing and he made his way over & over to retrieve them. He was given the nick-name "JayNut" by my uncle, and JayNut made his presence and demands known every day.